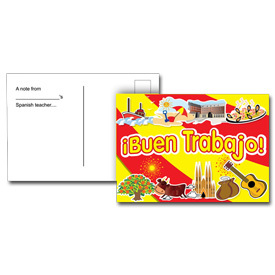 A pack of 20 Spanish reward postcards which are great for rewarding hard workers with a quick note home! A Spanish-language message will praise your pupils for their achievements in their Spanish lessons. It has been lovely to hand these to children who have chosen to do Spanish for their homework, so that they take the card home and keep it.